Need I say more, Cate Blanchett is one of the best actresses around at the moment. She is known to be able to play so many different characters in different movies, and is able to do it well. The actress won an Academy Award in 2004 for her portrayal of Katherine Hepburn in The Aviator (2004) opposite Leonardo DiCaprio, but has also been nominated 4 other times. Cate Blanchett hails from Australia, but had no trouble making it big in Hollywood. Her first screen acting role was in an episode of an Australian television show 'Police Rescue'. A year later, in 1994, she starred in the movie version of the show. A few more Australian projects followed, until she starred in Paradise Road (1997) with Glenn Close and Frances McDormand. A year later, she got her big break in Elizabeth (1998), in which she played Elizabeth I and scored her first Academy Award nomination for Best Actress in a Leading Role. Many Hollywood movies followed, such as An Ideal Husband (1999), Pushing Tin (1999), The Talented Mr. Ripley (1999) and The Gift (2000). In 2001, she starred in the first installment of the successful Lord of the Rings films, The Lord of the Rings: The Fellowship of the Ring (2001). She starred in the next two installments of the series as Galadriel, earning her more recognition as a fantastic actress. In between the success of the Lord of the Rings, she starred in a few more Hollywood and Australian films like Charlotte Gray (2001), Veronica Guerin (2003) and The Missing (2003) with Tommy Lee Jones. But it was after these films that Cate got fully recognized for her superb talent. The Aviator (2004) was a Martin Scorsese film in which Leonardo DiCaprio plays Howard Hughes, a multi-billionaire film producer, celebrity and aviator. The film follows his life, and his loves which included Ava Gardner (played by Kate Beckinsale) and Katharine Hepburn. Cate played Katharine Hepburn, the fiery red-haired actress from the Golden Age of Hollywood. For her master portrayal, she won the Academy Award for Best Supporting Actress in 2004, and soon started to star in more films which showed off her versatility and talent. She starred in one more Australian film, Little Fish (2005), before starring in Babel (2006), a multi-plot film opposite Brad Pitt. Also in 2006, she appeared in the Steven Soderbergh film The Good German (2006), which was shot in black-and-white to suit the World War II setting. Notes on a Scandal (2006) was another one of her 2006 successes, and she was nominated for an Academy Award again for Best Supporting Actress. Her next film, I'm Not There. (2007), earned her another Oscar nomination. In this multi-plot film which honoured the life of Bob Dylan, she played Jude, who in fact was a man. In the same year, she was also nominated for Best Actress in a Leading Role for the sequel to Elizabeth, Elizabeth: The Golden Age (2007). She did not win either, but will surely win another Oscar in the future. In 2008, she starred in Indiana Jones and the Kingdom of the Crystal Skull (2008) as the villain, Irina Spalko. Her last film was the classic The Curious Case of Benjamin Button (2008), in which she again appeared opposite Brad Pitt. 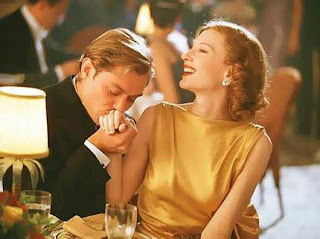 This is a story of a man who is born old and ages backwards, and his relationship with Daisy, who is played by Cate. In the future, Cate will be seen in Robin Hood (2010) as Maid Marian, and also in The Hobbit: Part I (2011), reprising the role of Galadriel. Cate Blanchett is one of the most versatile and talented actresses around, and expect to see more of her as the years go by. As far as I'm concerned Cate Blanchett is the best actress working today, period! Really, there is no one working at her level, save Meryl Streep! She can play anything & anyone and is so captivating to watch! Live on Cate the Great!